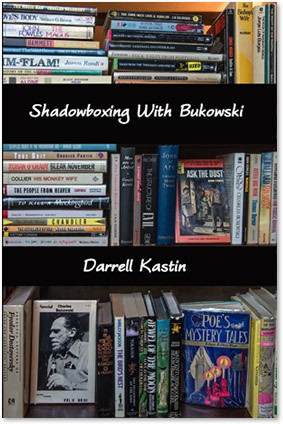 A refreshingly original, deftly crafted and consistently compelling story from beginning to end, "Shadowboxing With Bukowski" clearly documents author Darrell Kastin as an exceptionally gifted novelist. While certain to be an enduringly popular addition to community library General Fiction collections, it should be noted for personal reading lists that "Shadowboxing With Bukowski" is also available in a Kindle edition ($4.99). A man works to keep his California bookstore afloat while meditating on his relationship with Charles Bukowski. Kastin (The Conjurer and Other Azorean Tales, 2012, etc.) returns with a novel about a West Coast bookseller. When bibliophile Nick Kastinovich gets married, his father, disappointed in his son’s life so far, lets him run the Little Big Bookstore, hoping that the small business will teach Nick a sense of responsibility. Nick settles into his new home and profession in San Pedro, home to poet Bukowski, who happens to frequent the restaurant across from the bookstore. The two build a polite familiarity, but San Pedro proves inhospitable to the book business. Try as he might, Nick can’t seem to jump-start the Little Big Bookstore, and his life begins to deteriorate as a result. He fights off creditors as he continues to buy books, and his marriage turns cold as he fantasizes about a beautiful customer named Katherine. Woven together, these threads form the novel’s central plot. Unsurprisingly, however, Bukowski is just as important as Nick. Less an active force than a constant influence, the poet, his work, and his occasional benevolence toward the bookstore prompt the protagonist’s reflections on life and literature. Bukowski is also a primary literary influence for Kastin. Presumably, Nick Kastinovich is Kastin’s version of Hank Chinaski (Bukowski’s literary alter ego), and sentences like “the bookstore, San Pedro, all was just as corrupt, all of it rotting from the inside” evoke the poet’s gritty nihilism. Sometimes, this makes Kastin’s prose feel derivative, but more often it feels like a successful homage. Indeed, much of the book honors Nick’s/Kastin’s literary heroes: Dostoyevsky, Cervantes, and most of all John Fante (particularly, Ask the Dust). Kastin believes wholeheartedly in Nick’s mission “to uncover great poets and essayists, playwrights and historians, and to share these discoveries with others, to keep these writers from fading into oblivion.” This sincere devotion should speak to any reader, but especially to booksellers, who will likely recognize themselves in the protagonist’s challenges and love of literature. A novel about a life spent surrounded by books, heavily influenced by the grimy realism of a poet’s life and work. Darrell Kastin's short, comic novel, Shadowboxing With Bukowski, is a finely written tale of a young man's misadventures in the book-selling trade and literary sub-culture of contemporary Los Angeles. The hero has a worthwhile, though romantic and ill-conceived dream--he is, after all, a lover of books and simply wants to share his love by selling good ones or, if necessary, giving them away. The narrative is self-deprecating and picaresque. Few books make me laugh out loud, but this one did. I read it, and I LIKED it! Shadowboxing With Bukowski captured a moment in time that I remember very well. I think it adds another piece to the Buk legend. ~ John Martin, publisher, Black Sparrow Press. Shadowboxing With Bukowski not only captures Bukowski's elusive (some say nonexistent) classic high grace, but offers a humorous, uncanny depiction of desperately running a bookstore while it was running itself out of success. Fun stuff fluffing up the underground heart. ~ Douglas Blazek, poet,Ventriloquy of Light & Gutting Cats in Search of Fiddles, editor of The Bukowski Sampler, publisher/editor of Open Skull Press, Olé. Kastin (The Undiscovered Island, 2009) uses the landscape and culture of the Azores, his maternal homeland, to marvelous effect in this spellbinding collection of short stories that tend toward folklore and magical realism. Nine islands off the coast of Portugal are the setting for this debut collection of 18 stories that reach for universality in both meaning and appeal. Each tale chronicles the curious fate of an islander beset by forces of nature, the supernatural, and often family and neighbors. A woman can steal others’ pain; another, after hearing angelic voices in the waves, is swept out to sea only to return alive, though she now grows seasick on solid ground. A dress can win a man’s love. Witch conjurings can carry a fisherman’s boat from its dock to a distant beach, landing him at the feet of his future wife. Even death might not detach men and women from the patterns of life: A skeleton craves and tastes wine, and relationships flourish among the dead. Kastin’s captivating stories are beautifully crafted, transporting readers on these strange journeys. The conflicts and travails have a timeless air; only a few are unambiguously set in modern times, and most could take place at any point in the last few centuries. Each story stands and succeeds alone, yet as a whole, the collection offers a convincing view of life as a fierce adventure, often uncontrollable and always awe-inspiring. In this stellar show of magical realism, the supernatural is accepted as fact by characters who observe or encounter it. For better or worse, it informs and transforms their lives. Readers, too, will be enchanted by its power. An extremely impressive blend of escapism and portraiture of the human condition, following in the footsteps of Jorge Luis Borges and Gabriel García Márquez. The collection of stories presented in The Conjurer & Other Azorean Tales leaves the reader with the delight of being privy to the secrets of the local residents. On these islands, witches borrow boats from unsuspecting fishermen, bones of sailors lost at sea miraculously return years later to comfort lonely widows, and beautiful women feel more connected to the mysterious depths of the sea that surrounds them than to their own families. The dead are never far away and often come back to influence the lives of their spouses or offspring. The stories are captivating and haunting, but also very relatable. Wives nag their husbands too much, children fail to do what their parents want them to do, and natives leave in search of a better life only to find themselves terribly homesick. For any lover of fairy tales and questioner of life beyond the grave, this compilation is an absolute joy, flawless in both selection and delivery. Beyond the beautiful and unexpected images, the narrator has left behind clues of his self, his worlds and his soul, expressing that which only the best literature is able to do: a whole philosophy of life, a whole aesthetic of a different mode of being and existing, the certainty that only love and beauty can save us in the face of the primordial and perpetual chaos that surrounds us. Kastin seems to understand better than most what a literature of identity claims to do and communicate. The mysticism that lies within the land draws us to it. The Conjurer & Other Azorean Tales is a collection of short fiction surrounding the Azorean Islands and the island's certain beauty and majesty, and the wisdom that seems to float about it. Drawing on the naturally supernatural, The Conjurer & Other Azorean Tales is an enticing collection of short fiction, very much recommended reading. The Conjurer, yes, indeed. This is a rare book in which the title is not only descriptive of one of the characters, but even more appropriately and indelibly describes the author. This collection of tales, rich with mystifying but vivifying paranormal experiences;the kind that generates legends, reminds us again that this author earns close attention — and rewards close attention. Connoisseurs of compelling story-telling will find much to cherish here, including the convincing gift of meticulous observation, and invariably authentic dialogue. Escrita Criativa de Darrell Kastin: "He is Charmed"
Aos poucos o inverno rigoroso se despede, derreteram-se os “capuchos” e os flocos de neve que debruaram as montanhas, cristalizaram as ribeiras, pintaram de branco os campos, os telhados de cinquenta e seis municípios de Santa Catarina e até o majestoso Cambirela, no continente em frente, ficou coberto de neve. Coisa nunca vista pelas bandas insulares e litorâneas catarinenses, deixando o ilhéu aturdido com a novidade climática e o Brasil incrédulo. Até parece coisa das bruxas, segredavam abismados. tiny cemetery in Quebrado do Caminho, on the island of Pico, in the Azores. The epigraph above is taken from the last and longest story, titled “Night Magic”, in The Conjurer and Other Azorean Tales by Darrell Kastin, recently published in the United States. The writer, of Portuguese-American heritage, with maternal roots in the island of Pico, was born in Los Angeles, California. He is currently living in Sacramento, the capital of the State of California, where one of our Azorean-American communities has existed for a long time. Married to an Azorean, the author has spent some lengthy stays in our archipelago, especially in Pico and Faial, the two islands that serve as geographical, human, and historical reference to both the narratives in the present volume, as well as his novel The Undiscovered Island (2009). These stories were written throughout a long stretch of time, starting in 1987-88, when the author lived here. Knowledgeable of our history, literature, music and the arts in general (he released the CD Mar Português in collaboration with his daughter Shawna Lenore, setting to music the poetry of Fernando Pessoa and Florbela Espanca), all of his writing is yet another constant return to the mythology of the islands, which for him never lose the mystery of their violent and fiery origins and of their solitary existence in the middle of the Atlantic. Darrell Kastin, in the novel referenced and now in these tales, resorts inevitably to Magic Realism (just as Katherine Vaz would also do later in Saudade) and is able to suspend the beliefs and pragmatic experiences, even of readers that live and know our everyday lives well, marked, above all, and again and again in our history, by the need for survival, stripped of any doubt whatsoever about the practical and non-mystical struggle on land and sea. Because of our institutional history, which leaves so many unfilled gaps, with facts still unknown, and an imagination which concentrates itself mainly on dates, names and a few deeds of captain-generals, the narrative resources to which Kastin resorts somehow permit the completion of the rest of the story. on voyages that end only with his return to the origins of the island, where he lives almost alone and apart from the rest of the community. He is left with memories of passing through the most distant geographies, including, obviously, Los Angeles, (“the city wanted to eliminate all traces of him, to make him a stranger in his own city”), his last address in America, and where wife and daughters abandoned him. Although this may seem to be the strangest of narratives, it is in this one, above all in the collection, where the author seems to discharge without limits or fears what goes on in his soul. Author-narrator, it matters little the biographical details or lives really experienced – the power and clarity of each word or expression, the symbolism in each expression and the movement between the living and the dead leaves me no doubt as to who speaks and who is telling us his anguishes, memories and obsessions. The game of mirrors is necessarily distorted – but it is in it that we see ourselves; just as I’m convinced that it is in it that the author best sees his own self and it is in it that a certain “shock of recognition” happens for those readers that have returned home from any Diaspora, having to leave again soon after in search of the imaginary island still left to discover. Beyond the beautiful and unexpected images, the narrator has left behind clues of his self, his worlds and his soul, expressing that which only the best literature is able to do: a whole philosophy of life, a whole aesthetic of a different mode of being and existing, the certainty that only love and beauty can save us in the face of the primordial and perpetual chaos that surrounds us. The rest of the characters in this or in other tales don’t stop to think or face the torment of being alive – they drink to forget. The taverns have substituted the churches – the saints and candles are left home with the women, the inebriated lucidity is another way out or a companion in lost paradises of what remains of the mythical Atlantic isles. It is still in “Night Magic’ that the narrator summons everything that could be a register for the rediscovery of new imaginary island-countries, the island ahead as our irrepressible obsession. Literature, music and the sebastianista enchantment contained in a book, a poem, or a prayer to saints, incensed and illuminated in the darkness of the Azorean homes. Rarely do we have an indication of the fictional times of each of the narratives. We know we are in a late and incomplete modernity but as for the rest, all is set in an immemorial time of the men and women who settled here, a “time out of time”, as someone wrote in the past about another of our arts. The Conjurer & Other Azorean Tales reads almost as a novel of narratives interconnected by its characters, themes and common landscapes, almost all taking place in the island of Pico, and the American Diaspora, all of them rooted in the proud rurality of a people that refuse to live under siege only because their imagination is permanently searching for new worlds, real or simply dreamt up, even beyond death. The first story, The Conjurer, has as narrator Valdemar Coutinho, who somewhere in America tries to teach his grandson some of the mysteries of the world and of men, transmitting and making him recognize the essence of his distant Atlantic roots, opening his eyes and mind to that which gives meaning to our lives: the discovery by means of the magical arts of what we imagine, and even of that which we don’t yet imagine. Everything here, in all these stories, seems to have as a subtext or theme only one thought: to be alive is to want to know and understand what is hidden from the immediate evidence, the interconnectedness of all that we call “universal”, the innate will in humanity which made his Portuguese ancestors risk all and everything to reach the other side of their misty horizons. In this sense, Kastin seems to have understood better than most what a literature of identity claims to do and communicate: to revise and reaffirm a national history that otherwise is left unexplained, and thus explores what in truth made us and continues to make us navigate towards the unknown. If this appears too mystical, let’s return to the Lusíadas, a work also absorbed by the author of these tales to great effect. That a writer, descendant of Azoreans and European Jews should understand that the need for endless wandering is the force that moves all of our history and identity, should surprise no one. The fact that he is able to depict, with such beauty, idealism and memories buried in time and in the seas of the world, and remind us of who we were and who we are, even in a language not our own, is part of a miracle that is the appearance of a Portuguese-American literature, of which these narratives are a distinct part. I believe that Darrell Kastin not only sees the Azores and its mythology as a partial metonymic of the world, but that it is precisely here that the entire world is concentrated, and what is left outside are the great “cities” that, just like the Los Angeles he depicts, either absorb us, thus destroying us, or we leave them with the same determination that propels us to continually seek possible refuges. The great North-American novelist Richard Zimler appreciatively wrote of Kastin’s writing, “A lyrical and exuberantly detailed tale of mystery and mythology intimately linked to the unique history and natural beauty of the Azores.” Without a doubt. Something else takes place in these pages – a vision without equal of our life experience and survival, alone, in the middle of the most violent and yet tender, liberating sea. 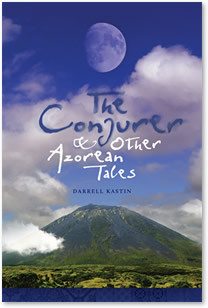 Darrell Kastin, The Conjurer & Other Azorean Tales, Tagus Press UMass Dartmouth, Dartmouth, Massachusetts, 2012. ** Vamberto Freitas is a Portuguese writer, essayist and literary critic from the Azores. His work is featured in several newspapers and journals, both in the Azores, Portugal and in the Portuguese-American media. He teaches at the University of the Azores in Ponta Delgada, S. Miguel. His latest book is titled Bordercrossings/ Leituras Transatânticas, Letras Lavadas, Edições, Ponta Delgada, 2012. The Undiscovered Island is the recipient of the 2010 IPPY Independent Publisher's Award for Multicultural Fiction Adult. After Ulysses founded Lisbon as legend has it, he sailed off into forbidden waters and landed on the isle that held the fountain of Purgatory as Dante had it. Might this have been the Azores? The Undiscovered Island could confirm the fact, as all of Portuguese history, so legendary as it is, comes to a kind of culmination on these isles. Time is of no avail as its end and passage convene in this novel in what is a romp of detective story, epic, and family quest. What a great read! A story of mystery and magic—magical appearances and mysterious disappearances, mysterious women and magical islands—beautifully and lyrically told. Indeed, I want to be on record as being among the first to recognize this book as a seminal work in 21st Century literature. It is certain to inspire a host of doctoral dissertations. And will be returned to periodically and earnestly by literary critics, as well as language scholars. A lyrical and exuberantly detailed tale of mystery and mythology intimately linked to the unique history and natural beauty of the Azores. THE UNDISCOVERED ISLAND is a uniquely fascinating book: a kind of mystical mystery, rich with the people, the folklore, and the ambiance of the Azores. You don't know where you're being led, but you realize quickly — vital in such a novel — that you're in the hands of a writer who does know, and whom you can trust to get you there both safely and surprisingly, avoiding all cliches, all stereotypes of character and action, all cardboard backgrounds and mashed-potato filler. I would recommend it to anyone — but I'd never lend it, because I'd never get it back. Go get your own. The Azores is an archipelago hundreds of miles west of the coast of Portugal, located in the mid-Atlantic. It is a relatively unknown (or unexploited) area that is not often discussed in the media-or in literature. This will change, however, if Darrell Kastin and the University of Massachusetts Dartmouth’s Center for Portuguese Studies and Culture has any say. Kastin, who descends from Azores natives, has used his knowledge of the islands, their culture and their history to weave, in The Undiscovered Island, a skillful tapestry of myth, history and personal revelation that is nothing short of fascinating. The story focuses on Julia Castro, who travels to the Azores from her home in California to seek out her father, who has mysteriously gone missing. Through her search for him, Julia encounters legends and superstitions that pervade the islands, colorful locals, local history and historical fantasy, and the magic of her roots and of herself. What Kastin has done with The Undiscovered Island is bring all of the color and quirk of this beautiful and under-appreciated area to the world’s attention-and we should thank him for that. Ashlander Darrell Kastin's new novel, "Undiscovered Island," uses a mix of reality and magic to explore ancient Portuguese myth in a setting of the seldom-publicized Azores Islands, his ancestral homeland. The deftly written and attractively packaged 410-page work quickly pulls you into the mysteries of a worried young woman searching for her disappeared father (a writer) amid the strange appearance of a new island in the Azores, which are nine islands some 900 miles away from their mother country of Portugal. In 2009, I have reviewed... 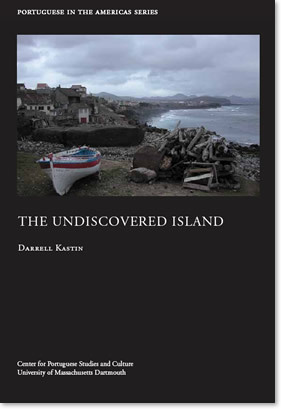 The Undiscovered Island by Darrell Kastin... (and) am heartened to see that mine has not been the only review of this remarkable book and that its Amazon ranking throughout December has been healthy. The Undiscovered Island deserves all of this and more, for it is a book of wonders—a family saga, a chronicle of Portuguese history as it was and should have been, a scholarly text, a Quixotic quest, and a beguiling mystery. Whether or not the novel is a fantasy, I cannot say, because its poetic, dream-like plot melds the ordinary and the extraordinary so seamlessly, believably, and, dare I say, realistically that 'fantastical' seems like not only an unimaginative descriptor but also an inaccurate one. Creio que a primeira pergunta a fazer sobre The Undiscovered Island de Darrell Kastin torna-se inescapável: Quem é este narrador que a início do século XXI ainda se interessa pela sorte do clã Canto e Castro e da caída aristocracia lusitana (falo dos aqui reinventados, não dos da História) que traça ou confunde as suas origens e sobretudo as suas tragédias com as da Nação? A resposta, especialmente vinda da plebe letrada, terá de ser sempre ambígua: um luso-descendente em busca das raízes, ou do seu lugar entre os seus dois mundos, e obcecado pela grandeza e glória dos seus protagonistas. The Undiscovered Island reconstitui a seu modo tudo e todos que levaram ao estado actual da Pátria mais ou menos dormente, os descendentes de velhos navegadores agora estirados meio bêbados nos cafés locais. Eis aqui neste romance outro acto de resistência dos que não aceitam e parece que nunca aceitarão a condição da "vil tristeza", do esquecimento, do branqueamento de toda uma história trágica que acabou, bom, como sabemos, e apenas nos ofertou a todos, aristocratas e desgraçados, a possibilidade de fugir em porões ou em terceira classe rumo à luta pelo pão de cada dia. The Undiscovered Island poderá ser também lido como uma história da loucura redentora - enquanto procurarmos a proverbial "ilha em frente", essa outra que permanece encoberta em nós todos, manifestando-se de quando em quando em todo o seu esplendor mítico para logo se afundar novamente, saberemos quem somos, teremos razão de vida, morreremos glorificando os antepassados e assim garantindo a dignidade dos vindouros. Este longo e denso romance de Darrell Kastin, autor de raízes maternais açorianas, nascido e residente em Los Angeles (esse deserto tornado metrópole de outros sonhos e outras fantasias), é, como toda a boa ou grande ficção, um mergulho real e metafórico na mítica nacional e das ilhas, no sonhado poiso dos amantes camonianos, na mística do sebastianismo, no nosso ainda supremo Fado. The Undiscovered Island está recheado das nossas mais íntimas e canónicas referências poéticas e literárias, enquadrado em toda a nossa história, sempre (felizmente) mais imaginada do que confirmada. The Undiscovered Island, que o insuspeito Gregory Rabassa classifica de ³história detectiva, épica, e em busca da família², é um romance profundamente marcado pela ternura e pela ironia de como um narrador vê a sorte dos seus protagonistas, simultaneamente uma negação do hiper-realismo na arte e na vida dos nossos dias, recorrendo à imaginação febril e alucinante dos seus personagens, uma visão trágico-cómica de corações em perpétuo conflito e choro. Esta é já uma distinta técnica narrativa de outros escritores luso-americanos, como Frank X. Gaspar e Katherine Vaz, nas suas convocações da nossa mítica ibérica, atlântica e religiosa. Um Sebastião do Canto e Castro, imigrante falhado e alienado na Califórnia, escritor mais ou menos obscuro, naturalmente, decide regressar aos Açores, onde passa a viver os seus dias numa modesta residencial da Horta, rodeado de livros e papéis, obcecado pelo ressurgimento da Décima Ilha que virá um dia do Banco - teria de ser! - Dom João de Castro, entre São Miguel e a Terceira. Estamos nos anos 80, e nas ilhas já nem tanto adormecidas surgem os mais desvairados rumores ante uma desusada comoção da Natureza: abalos de terra, medonhas tempestades marítimas, caravelas fantasmas aparecendo e desapare- cendo no horizonte, histórias de sereias à vista levando consigo alguns tristes com fome de amor e prazer, a chegada do Apocalipse ou do Paraíso, os Açores com o "Novembro no coração" de Ismael. Atira-te ao mar em demanda do Nada ou da Miragem. À procura de seu pai perdido, chega Júlia da Califórnia, e depois seu irmão, António, ambos concebidos nas ilhas, mas um deles já nascido na América, cada um sem saber bem quem é, sem a noção clara de onde e de quem vêm. Estão perdidos, como todos os americanos sem memória. Nada aqui faz qualquer sentido, como nos sonhos ou delírios desconexos e doentes, a não ser o reencontro destes dois jovens com o seu passado, com as suas origens, com o seu legado histórico e cultural. Vindos de uma família culta pelo lado do pai perdido, Camões, Pessoa e Antero passam a ser-lhes vozes do seu próprio ser. The Undiscovered Island é de uma fluência e erudição extraordinárias, uma convocação de todas as nossas mentiras e desejos, nas ilhas, no país, na Diáspora. O verdadeiro valor dos Canto e Castro (os desta ficção) e de todos os seus pares no nosso país foi o seu falhanço e delírios, uma vez mais, de grandeza, palácios construídos que gerações depois cairiam em ruínas, ou seriam eventualmente restaurados pelo dinheiro dos plebeus. Ironia pura e justa. Tivemos todos que navegar novamente, reencontrar a nossa dignidade nas mais improváveis geografias. Se Deus alguma vez pensa nos portugueses, que abençoe para sempre Dom Sebastião, eternamente (esperemos) Encoberto, e que esse mesmo Deus abençoe o ano 1910, quando o povo português se tornou digno de si e se vingou de todo o seu secular sofrimento. No fecho de The Undiscovered Island há um acontecimento menor, mas de todo significante. Um velho Mateus do Canto e Castro morre quase esquecido e isolado no Rio de Janeiro, no desgosto de nunca ter sido ou vivido o seu suposto "destino", cheio de medo pelos seus apanhados no meio dos "avisos" primordiais da terra açoriana e do seu mar de chumbo. A história repete-se aqui, apesar de Marx: como os infelizes da frota de Pedro Álvares Cabral que lá foram deixados brutalmente para comerem ou serem comidos, Mateus saboreia desse modo, num simbolismo aqui um tanto forçado da minha parte, as agonias do nosso povo no exílio. Júlia e António, numa terna e inesperada viragem do romance após umas centenas de páginas de dúvida e sustentada alucinação, acabam bem mais felizes nos Açores - ele reconciliando-se com as suas origens atlânticas, ela compondo e tocando música com Nicolau, seu amante e seu comparsa moderno e sem sangue condenado nas veias.